25933 Private Edmund Westway Bromell of the 1st Battalion, the Devonshire Regiment. Son of John and Elizabeth Bromell (née Brimacombe). Born in Sutcombe, Holsworthy, in the March Quarter of 1882. Died 23 April 1917 aged 35. 24688 Private Gilbert Clifton of the 6th Battalion, the Queen's Own (Royal West Kent) Regiment. Son of William and Ellen Clifton (née Littlejohns) of Fore Street, Holsworthy. Born in Holsworthy in the September Quarter of 1893. Died 3 December 1917 aged 22. Awarded the Military Medal. 265073 Private Alfred Cloak of the 1st/6th Battalion, the Devonshire Regiment. Son of William and Elizabeth Cloak. Born in Quethiock, Cornwall in 1881; came to Holsworthy to work as an ostler at the New Inn in the Higher Square. Died 25 April 1919 aged 37. 55389 Private Thomas Cowling of the 13th Battalion, the Welsh regiment. Son of John and Elizabeth Cowling; husband of Irene May Cowling of 2 Penrose Terrace, Bodmin Street, Holsworthy. Born in Holsworthy in the December Quarter of 1885. Died 21 July 1917 aged 31. 60552 Private William Edgar J Daniel of the 17th Battalion, the Royal Welsh Fusiliers. Son of William and Mary Daniel, 19 Market Square, Holsworthy. Born in Holsworthy in the December Quarter of 1895. Died 31 July 1917 aged 22. 33992 Lance Corporal Clifford James Ford of the 8th Battalion, the East Surrey Regiment. Son of Joshua and Mary Ann Ford of Victoria Square, Holsworthy; brother of Edgar and Edwin (see below). Born in Holsworthy in the the June Quarter of 1891 - enlisted in Kingston-on-Thames, Surrey. Died 26 November 1917 aged 26. 36855 Lance Corporal Charles Edgar Ford of the 1st Battalion, the Duke of Edinburgh's Regiment. Son of Joshua and Mary Ann Ford of Victoria Square, Holsworthy; brother of Clifford (see above) and Edwin (see below). Born in Holsworthy in the December Quarter of 1898. Died 18 September 1918 aged 19. 72216 Private Edwin Henry Ford of the 7th Battalion, the Cheshire Regiment; formerly 71907 in the Devonshire Regiment. Son of Joshua and Mary Ann Ford of Victoria Square, Holsworthy; husband of Katie E Ford (née Dyer); brother of Clifton and Edgar (see above). Born in Holsworthy in the September Quarter of 1880. Died 21 May 191 aged 38. 290836 Private William Gerry of the 9th Battalion, the Devonshire Regiment. Son of Richard and Fanny Gerry of Little Knowle, Pyworthy, nr. Holsworthy; husband of Maude Alice Gerry (née Lewis) of 1 Belle Vue, Holsworthy. Born in Holsworthy in the September Quarter of 1884. Died 12 October 1917 aged 35. 202417 Private Frank Gilbert of the 4th battalion, the Ox and Bucks Light Infantry. Son of William and Elizabeth Gilbert (née Jones) of Pyworthy nr. Holsworthy. Born in Holsworthy in the September Quarter of 1892. Died 1 June 1918 aged 26. 265499 Private John Henry Gliddon of the 1st Battalion, the Devonshire regiment. Son of William and Jane Gliddon of the Farm House, Clawton. Born in Clawton in the September Quarter of 1883. Died 4 October 1917 aged 34. 202499 Lance Corporal Percy James Gliddon of the 1st/4th battalion, the Ox and Bucks Light Infantry. Son of Henry and Ellen Gliddon (née Crocker) of 11 Bodmin Street, Holsworthy. Born in Holsworthy in the June Quarter of 1897. Died 16 August 1917 aged 20. 2015 Rifleman Frederick Glover of the 1st/8th battalion, the London Regiment (The London Irish Rifles). Son of the late George Page Glover and Jane Glover of Bodmin Street, Holsworhty; husband of Marjorie K N Glover (née Ong) of 24 Crown Street, Brentwood, Essex. Born in Holsworthy in the June Quarter of 1888. Died 25 September 1915 aged 27. 14065 Private William Henry Griffey ("Willie") of the 12th battalion, the Gloucestershire Regiment. Son of William Henry and Ellen Griffey (née Joliffe). Born in Holsworthy in the September Quarter of 1886. Died 21 July 1916 aged 29. 15569 Private Henry Browne Hamley of the 8th Battalion, the Devonshire Regiment. Son of William and Mary Hamley (née Browne). Born in Bridgerule in the June Quarter of 1890. Died 26 October 1917 aged 27. 285172 Private Archibald Richard Hayman of the 1st/1st Bucks Battalion of the Ox and Bucks Light Infantry. Son of the late Richard Hayman and Bessie Hayman of Dinworthy, Bradworthy; brother of Josiah (see below). Born in West Putford, nr. Holsworthy, in the June Quarter of 1895. Died 16 August 1917 aged 22. 345728 Private Josiah Hayman of the 16th Royal Devon and Royal North Devon Yeomanry of the Devonshire Regiment. Son of the late Richard Hayman and Bessie Hayman of Dinworthy, Bradworthy; Brother of Archibald (see above). Born in West Putford in the June Quarter of 1897. Died 3 December 1917 aged 20. 463006 Private Stanley George Jeffery of the Royal Army medical Corps, the 46th Casualty Clearing Station. Son of Samuel and Mary Jeffery of 24 Chapel Street, Holsworthy. Born in Holsworthy in the June Quarter of 1897. Died 30 May 1918 aged 21. Major Frederick William Oliver of the 28th Battalion, the Canadian Infantry (Saskatchewan Regiment). Son of Thomas and Charity Oliver of The Bungalow, Holsworthy. Born in Holsworthy in the December Quarter of 1886, he became a Canadian National. Died 15 September 1916 aged 29. 202121 Private Charles Penwarden of the 2nd/7th Battalion, the Worcestershire Regiment. Son of James and Elizabeth Ann Penwarden of Dunsdon, Pancrasweek, nr. Holsworthy. Born in Pancrasweek in the March Quarter of 1885. Died 28 August 1917 aged 32. 128315 Private Edward Richards of the 41st Battalion, the Machine Gun Corps (Infantry). Son of John and Mary Richards (née Hawton). Born in Holsworthy in the December Quarter of 1898. Died 1 October 1918 aged 20. G/40131 Private John Trolove Sharpley of the 12th Battalion, the Middlesex Regiment. Son of Clement and Edith Sharpley (née Eggins) of Croft Road, Holsworthy. Born in Launceston, Cornwall, in 1895. Died 26 September 1916 aged 21. 498412 Sapper William Thomas Short of the Corps of Royal Engineers. Son of William and Minnie Short. 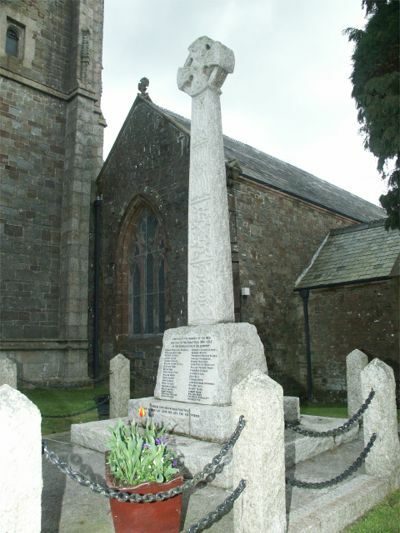 Believed to have lived at Bideford but enlisted in Holsworthy. Born in Hartland in 1882. Died 11 April 1918 aged 36. DEV/230051 Acting Leading Seaman Frederick Skinner of the Howe Battalion, the Royal Naval Division. Son of William and Grace Skinner formerly of Railway Cottages, Holsworthy, later of 8 Victoria Street, Holsworthy. Born in Holsworthy in the March Quarter of 1883. Died 4 June 1915 aged 30. "I saw Skinner fall and concluded he had been hit. Immediately afterwards our position was changed and consequently I saw or heard nothing of him." "I saw him shot through the stomach and dying." 206418 Private Alfred George Slade of the 2nd Garrison Battalion, the Northumberland Fusiliers; formerly 1672 Private Slade in the Devonshire Regiment. Son of John and Matilda Slade (née Jordan). Born in Pyworthy in the March Quarter of 1898. Died in Mesopotamia 13 October 1918 aged 20. Believed to be Herbert Northcott Slee, son of Francis and Mary Slee of Lower Square, Holsworthy, who was born in Holsworthy in the September Quarter of 1889. His military record is not yet confirmed. R/258377 Private Thomas Smith of the Royal Army Service Corps. Son of William and Elizabeth Smith. Born in Clawton, Holsworthy, in the December Quarter of 1879. Died 9 February 1917 aged 37. 4468 Private Richard Tape of the 6th Battalion, the Gloucestershire Regiment. Son of John and Elizabeth Tape; husband of Mabel Frances Tape (née Lewis) of Moorland Road, Fishponds, Bristol. Born in Holsworthy in the September Quarter of 1888. Died 22 July 1916 aged 28. Believed to be Albert Trace who was the son of Richard and Amelia Trace of Fry Street, Holsworthy who was born in Ashwater in the September Quarter of 1895. His military record is not yet confirmed. 241216 Private Hubert Ward of the 6th Battalion, the Queen's Own (Royal West Kent) Regiment. Son of Richard and Elizabeth Ward (née Braddon) of Simpson Farm, Holsworthy. Born in Holsworthy in the December Quarter of 1882. Died 30 June 1918 aged 25. 265427 Private William George L Ward of the 1st/6th Battalion, the Devonshire Regiment. Son of John and Jane Ward. Born in Bradford, nr Holsworthy, in the September Quarter of 1896. Died 28 May 1918 aged 21. K444497 Frederick James Wonnacott of the Royal Navy. Son of Frank and Laura Wonnacott of Fry Street, Holsworthy.Born in Holsworthy 11 April 1899. No other details of his military career are yet confirmed. 2295 Sergeant Reginald Alfred Yeo of "D" Coy, the 1st/23rd Battalion, the London Regiment. Son of Alfred and Emmeline Yeo of Holsworthy. Died 26 May 1915 aged 23.